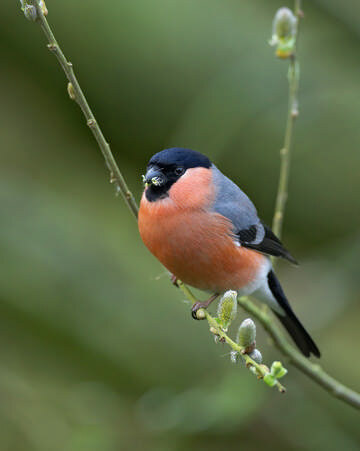 Because of its big decline in population, the Bullfinch is on the UK’s Red List of species of conservation concern, with a Biodiversity Action Plan nationally and locally for its conservation. Bullfinches declined greatly during the period of our First Atlas, the national population dropping by 44% in a decade, from the peak in 1974 to 1984. It has continued to decline, with the national index in 2004 about 20% lower than twenty years previously. It was therefore not surprising to find that the breeding distribution map shows a net loss from 65 tetrads compared to the First Atlas. There are 83 gains, mostly in the central southern part of Cheshire, but 148 losses spread across the whole of the county. They avoid the highest land in eastern Cheshire, and even the sandstone ridge. The habitat records show that most were in broadleaved or mixed woodland (33%), followed by farmland (31%) – where they particularly favour orchards and tall hedges – and scrub (18%). They are the least likely of our finches to use human sites (16% of records), with only three tetrads with an F1 (urban) code. This is a difficult species in which to confirm breeding, and most records were of pairs seen. Bullfinches are not obviously territorial, and may fly up to 1 km away from the nest if necessary to reach good feeding areas. Their song is thin and scarcely audible more than a few metres away, but they do indulge in exaggerated mutual displays. Nests are usually well hidden in bramble, hawthorn or similarly inaccessible bushes or hedges, and were found in only 23 tetrads. They rear the chicks on a mixture of soft seeds and small invertebrates, with the proportion of animal material gradually reduced as the chicks grow so that, by the time they leave the nest, they are getting seeds alone. The parents do not carry food in their bills but store it in their special throat-pouches – the only British finch that has this adaptation – so adults seen with bulging cheeks are probably on their way back to a brood. Most of the Atlas records (56) of confirmed breeding came from observers seeing family parties including young birds, distinctively different from their parents, plain brown with no black cap, as the adults feed their young for two or three weeks after they leave the nest. Five observers were lucky enough to have adults bringing their young to garden bird feeders. They nest typically from late May onwards and usually have two broods, making a late end to the season: half-grown chicks were ringed in a nest at Woolston on 4 September 1994. The reasons for the Bullfinch decline are not understood, but the drop has been much more severe on farmland than woodland and is likely to be linked to removal of hedgerows, and frequent trimming of those remaining, impacting on Bullfinches through loss of nesting habitat and food sources (buds, seeds and fruits). There is no link between Bullfinch populations and those of predators, but Sparrowhawks exert an influence on Bullfinch behaviour. When the raptors were scarce or locally extinct in the 1960s and 1970s following poisoning by organochlorine pesticides, Bullfinches were found in some counties in large flocks, sometimes one hundred strong, feeding in the centre of fields and orchards, well away from cover; this habit has died out as Sparrowhawks have increased (Newton 1993). There is unfortunately no information on Bullfinch numbers or behaviour in Cheshire and Wirral during this time as it coincided with the dark period in the county’s ornithology when bird reports were interested only in migration. The BTO analysis of 2004-05 BBS data puts the breeding population of Cheshire and Wirral as 2,580 birds (2,250-2,920), corresponding to an average of 8 birds per tetrad with confirmed or probable breeding, or just six birds per tetrad in which the species was recorded. The abundance map shows that the only areas with higher densities were the western edge of Cheshire, south Wirral and the mosslands north of Warrington.